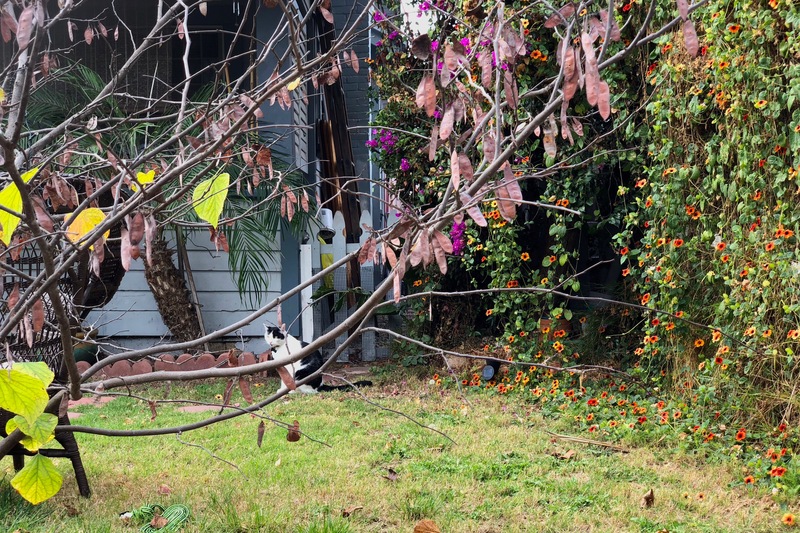 Alabama Street serves up more felines; I discovered two more on the same block yesterday. I’ve got another two on hold, hoping to get their names from their caretakers. The first of four, therefore, is Mr. Kitty—and, yes, that’s his name. The owner and I spoke briefly as he walked out to his car. Poor Mr. Kitty was rescued from a garbage dumpster! His estimated age is eight months. Turns out he is house/yard mate with Itchy Valentino, who sat on the sidewalk grooming when I approached. The vet says Itchy will always have the skin condition that makes his fur look a bit thin (and ragged), the owner explained. Maybe, but the medicine must be doing something, because his coat looks fuller to me; his owner agreed. I debated delaying Mr. Kitty’s debut, seeing that he stayed far back in the yard, and I had to shoot through a fence. Should opportunity arise, I will later add a second shot. I captured the Featured Image using iPhone X‘s second lens to 2X optically zoom. Vitals: f/2.4, ISO 16, 1/120 sec, 6mm; 12:38 p.m. PST. 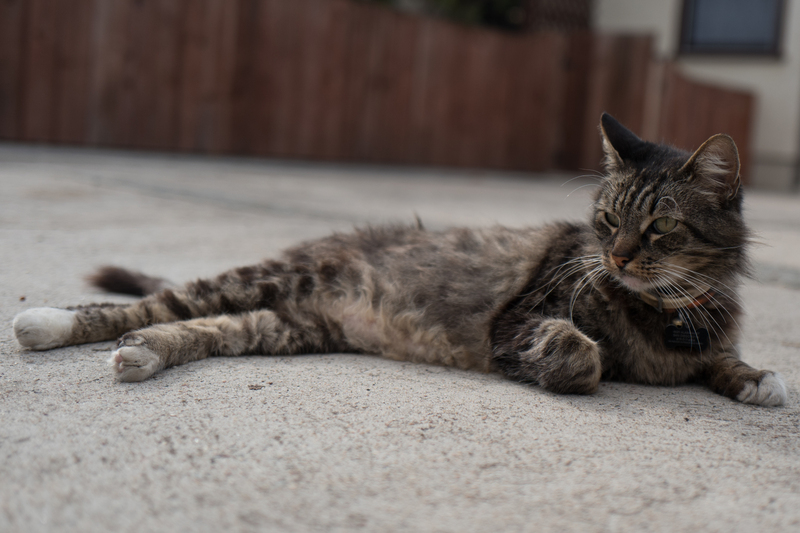 As a bonus, the accompanying photo is a fresh portrait of Itchy, taken with Leica Q. It’s a close crop. Vitals, aperture manually set: f/2, ISO 100, 1/4000 sec, 28mm; 12:43 p.m..
Also in this series: Scruffy, Roly Poly, Woo, Skull, Biscuit, The Colonel, White, Chipper, Frisky, Stretch, Needy, Farfisa, Mates, Hunter, Pee-Pee, Blue, Blue Too, Bonded Pair, Patience, Fess, Jumper, Frenemy, Looker, Cozy, Scout, Lurks, Skit, Mini, Betty, Black and White, Stalker, Bell, Chill, Sammy, Scratch, Poser, Star, Grey and White, Watcher, Herman, Comet, Roman, Willow, Chub, Nimbus, Watson, Lilo, Kit, Pepe, Twilight, Sebastian, Spot, Booger, Ash, Veruca, Riley, Mellow, Bonde, Flower, Glass, Black, BeBe, Fang, Bruce, Siamese, Pounce, Tortie, Haiku, Fraidy, Peso, Daniel Tiger, Dusk, Stride, Dainty, Spry, Tabby, Betty Too, Still, Levi, Shadow, Sophie, Wink, Ferals, Momma, Charlie, Tux, Cool, Benny, Jellicle, Itchy Valentino, Goldie, Nine, Amanda, Siesta, ChaCho, Charlie, Too, Mika, Crystal, Seeker, Mittens, Dancer, Smokey, Monkey, Captain Blackbeard, Season, Maven, Tink, Chunk, Curious, Hanoi, Bella, Tarry, Guido, and Maxine.